Raf Beeren is not one to sit still for long. He appreciates a quick pace in business that is methodical but dynamic. This high energy is also reflected in his home life, where he can be found hiking with his family on the weekends, playing water polo, any type of sport will do the trick. Raf has been a part of Hendrix Genetics for many years, but for those in the turkey industry, he’s a new face. Let’s get to know Raf, his thoughts on the new distribution network in the USA, and the future of the global turkey value chain. Can you tell me more about your background in agriculture and genetics? I’m the son of a baker. And although my grandparents once raised chickens and pigs on their small farm, my real entry into agriculture started in my university days. I attended the University of Wageningen in the Netherlands in Agriculture. During that process I discovered my interest in the field of genetics. I liked the use of statistics, mathematics, and science, so I decided to study Quantitative Genetics. From there, I did an internship in the US for a cattle breeding company where I studied cloning and embryo transplantation and the impact on cattle breeding programs. I really enjoyed this work. As a result of that project, the Research Institute asked me to do a similar project on cloning and embryo transfer in pigs as a postdoc position, and later on I presented my findings at the World Conference of Applied Genetics in Guelph, Ontario. This was my first entry into pig breeding genetics. Through a series of connections, I then started as a geneticist with a pig breeding company in the UK. In this role, I enjoyed genetics and working in the industry, but after a number of years, I was looking for a change. Around this time I entered into business development, sales, and marketing. The combination of business development and genetics was a good fit for me, and so I moved back to the Netherlands to pursue this. I became the Export Manager, working in international business development for Hypor for over ten years. This brings us to the present, where I have recently moved into my role within the turkey team. What do you find to be the most rewarding part about working in the industry? Throughout my career, I’ve really enjoyed working with people in this industry. They’re down to earth, accessible, transparent, and good-natured. I’m also proud of what we do and that we are an important part of the global food chain. What we do really makes a difference to the world around us, for both the developing and developed areas of the world. Around 2005, I took a break and worked in a totally different industry, but I found that I missed the people, the genetics, and working at the forefront of the value chain. I came back to agriculture a few years later and haven’t looked back since. Entering the commercial poult business in the US is an important moment. What do you recognize as some of challenges faced by turkey producers, and how will the new distribution network benefit these growers? First, our new network serves to future-proof the industry for the next twenty to thirty years. Many of the assets in the value chain required updates, and by constructing new hatcheries, farms, and transport, we’re ensuring good quality, healthy products are produced in an efficient system. Second, we want to make sure the animals placed in the farms around the country are healthy and able to be raised without the use of antibiotics. This is important for a number of reasons including the need to lead forward in animal welfare standards and food safety. This investment in an upgraded network will make a direct impact on these factors. By ensuring that turkey producers are providing good quality products in a sustainable manner, turkey will continue to be regarded as a healthy, good quality protein option for consumers. What do you see as most important for the future of the turkey industry? Increasing consumption is one of the biggest challenges for the future, and part of addressing this challenge is ensuring people want to eat turkey. This can only be achieved by making sure the products we provide are high quality, healthy, and raised in an animal friendly environment. There’s a great deal of competition in the meat and in the protein market. We have to make sure that turkey stays on the consumer’s menu and that there are more options for them. The US is one of the biggest regions of turkey consumption in the world, but to the rest of the world, turkey is unknown. The challenge for us is how can we make turkey consumption more appealing, both within North America and in new markets. I also want to add that I believe there is a bright future for turkey production. It’s a small market, about 2% of the global animal protein consumption. But, that means that there is a lot of room to grow. For markets such as India, China, and the continent of Africa, this represents billions of people who aren’t familiar with turkey. Of course, today, they are focused on cost-effective animal protein options, such as chicken and eggs. But as an industry, we have to make sure we are part of the landscape of the animal protein market for these developing areas. Why do you enjoy working for Hendrix Genetics? What attracts me to Hendrix Genetics is the opportunities and the freedom allowed by the company. It’s a family company where quick action is taken when making decisions. If you have a good idea, and a good plan, you will be heard and given the trust to execute. Hendrix Genetics also gives its people the room to take risks. They invest in their people, and they are able to balance the need to treat people with compassion, while also expecting that you will be accountable and deliver value with your talents. 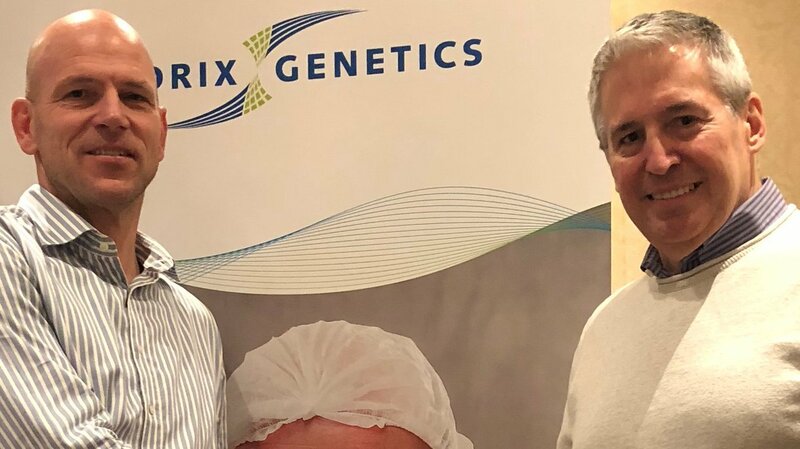 Over a relatively short period of time, Hendrix Genetics has shown tremendous growth, and I believe this is due to entrepreneurship and through giving their people the freedom to grow. Outside of work, what could we find you doing, listening to, reading, watching? I enjoy all kinds of sports; I’m still an active water polo player. And when I have the time, I try to train a couple times a week when I am at home by mountain biking, hiking, and running. I like all kinds of music, rock music in particular. Spending time with my family is important to me, and although I travel often for business, the family will still take a couple of trips together each year. We enjoy active holidays: skiing, hiking, and climbing. For me, I don’t need much downtime. A short bit of relaxation is good, and then I’m recharged and ready to head into the next activity.